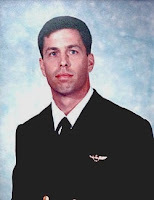 The family of Navy pilot Michael “Scott” Speicher announced today that the pilot were recently discovered in Iraq. His jawbone (which was used to identify him after study at the Charles C. Carson Center for Mortuary Affairs at Dover Air Force Base) was found in the desert, where according to local civilians, he was buried by Bedouins following his crash in 1991. This leads credibility to the theory that Speicher was never captured and likely died at the crash site. In a sorrowful resolution to the nearly two-decade-old question about his fate, the Pentagon disclosed Sunday it had received new information last month from an Iraqi citizen that led Marines to recover bones and skeletal fragments — enough for a positive identification. There is information in the comments section on MIA-POW bracelets.